Our summer online classes have been a huge success and gotten people excited to try some new techniques and projects. 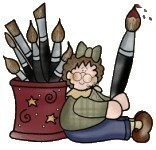 For fall we will be present a “Painter’s Fall Festival”. New exclusive projets and a ton of new information and lessions to make your fall painting experience exciting and fresh. Our main focus is to create a fun, comfortable learning environment that is packed with visual aids, ideas and seeds of creativity. Dr. Jekyll and Mr.Hyde would be proud. This is an exciting workshop with all kinds of new things for you to try. Backgrounds are so much fun and you will be amazed how you can create some stunning backgrounds and embellishments with crazy combinations of elements. So get your lab coat on and get ready to go a little crazy and become a master background “mixologist”. Learn to add the right mixes of shapes, texture and color to create some fun projects. If you did our summer classes you will really appreciate these additional ideas to add to your collection. If you didn’t join us, you will want to go back and sign up and see what else you can do. 5 great projects will be presented with so much information you will want to try it all. A good mix of fall/winter projects. You don’t have to be a “crafter” to enjoy this workshop. Learn tips and tricks to speed up your painting and get the most out of your painting time and experience. Learn how to take a single design and create multiple designs off of it. Learn advanced tips of using our basecoat stencils and how to ge the most out of your collection of shapes. 5 Holiday Projects will be done plus tons of ideas for creating multiple additional projects from the ones presented. Ornaments, ornaments, ornaments. We will explore lots of new ideas in creating ornaments. New themes and characters are easier to create than you think. Learn now to build an ornament design from start to finish. This is a fun one and will get you excited about new ornaments for the upcoming season. 5 sessions of ornament fun!